Once again, my apologies for the long silence. As you know, world events are unfolding with blinding speed in a bit of a roller coaster ride. Stunned by the September 11 terrorist attack on the United States and the massive assault on all forms of dissent that followed there was a moment when civil society faltered and seemed in mortal danger. Fortunately, it is now clear the movement is once again on its upward trajectory. Especially heartening was the juxtaposition of 60,000 people meeting at the World Social Forum in Porto Alegre, Brazil in celebration of the future we are creating together, with the simultaneous gathering of representatives of corporate rule at the beleaguered World Economic Forum in a state of siege behind police barricades in New York City to contemplate why things no longer seem to be going their way. Half a million more then took to the streets in Barcelona to tell the European heads of state that the old world is no longer acceptable. The momentum builds as the anti-globalization movement redefines itself as a pro-justice, pro-democracy movement and shifts its stance from that of a fringe element pointing out alternatives to that of a confident emerging majority forging a new mainstream. September 11 was a wake up call to the truth that we are the one’s we’ve been waiting for. We have too long waited in vain for the arrival of an heroic leader equal to the challenge of the current human crisis. Leadership must come from the bottom, from each and every one of us. Here in the United States the horror of the terrorist attack was immediately followed by the horror of our own government pressing ahead an agenda of militarism, civil repression, and new hand outs for the rich and powerful — with barely a whisper of dissent from within our two party political system. All among us who dared to raise our heads engaged the immediate task of struggling to maintain a window for principled dissent and to appeal to the common sense realization that in a terrorist situation responding to violence with violence only begets more violence. YES! magazine came out with a powerful Winter 2002 issue on the theme “Can Love Save the World?” to tell the stories of more promising approaches. It proved so popular that we did an immediate second printing. Groups all across the country, especially faith groups, have been using it as a resource for study group discussions. The full range of governmental response to 911 demonstrated beyond any reasonable doubt the enormous gap between world’s needs and the priorities of those who govern —yet another powerful reminder that the responsibility for leadership toward transformational change falls by default to civil society. See my article titled “Our Time to Choose” in the Winter 2002 issue of YES! The government response is a compelling demonstration of the unfortunate truth that our ruling institutions have no capacity for constructive leadership. On the positive side, the movement is responding by redirecting a portion of its growing energy from resistance to leadership. It is now more than three years since members of the International Forum on Globalization met in San Francisco in January 1999 to begin preparing a consensus document on Alternatives to Economic Globalization. Predictably, agreeing on what we are for has turned out to be a good deal more challenging than agreeing on what we are against. The need, however, has never been greater and the initial payoff is now at hand. A preliminary executive summary of the IFG report “A Better World is Possible! 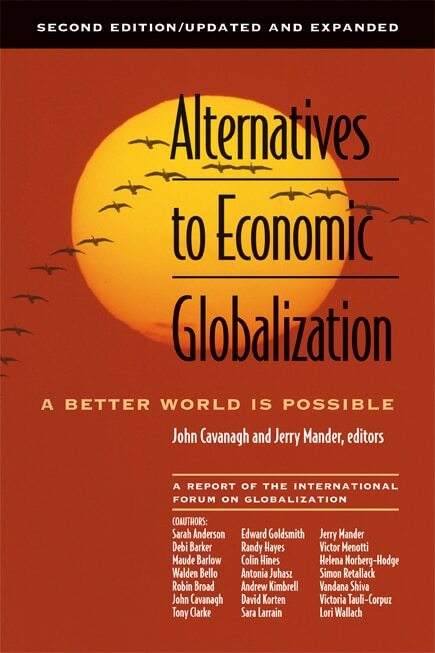 : Alternatives to Economic Globalization” was released at the World Social Forum in Porto Alegre on February 1 and is now available on the web in PDF format. The full report will be released as a book in Fall 2002 by Berrett-Koehler Publishers. The IFG plans to have a pre-publication version available by early June. PCDF advisors Maude Barlow, Walden Bello, Helena Norberg-Hodge, Sara Larrain, and Vandana Shiva are among the report’s authors. This report is distinctive in a number of respects, including scope, seriousness, and hard edge realism regarding what is needed to achieve a just and sustainable world based on ten essential design principles for democratic and sustainable societies. It is also distinctive in reflecting a broad consensus of movement leaders from both South and North. The IFG is calling for a thorough-going program of economic localization to ground both political and economic power in communities —delegating upward only those decisions that cannot realistically be made locally. 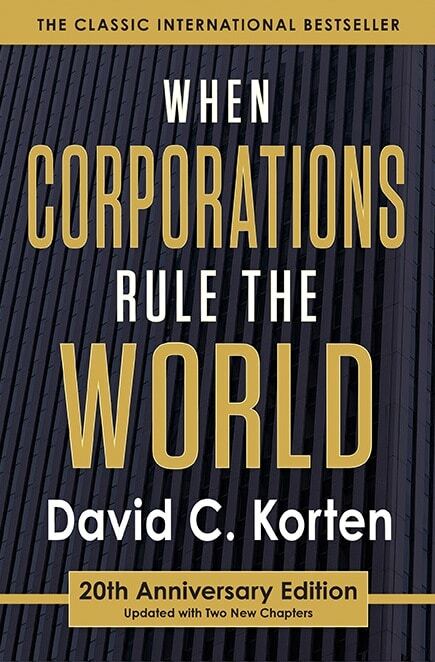 A chapter on corporations concludes that putting in place rules and regulations to hold global corporations accountable to the public good is not sufficient. Because, the publicly traded, limited liability corporate form allows for the virtually unlimited concentration of economic power in the hands of absentee owners who bear no accountability for the social and environmental consequences of how that power is used, its very existence is a standing invitation to abuse. 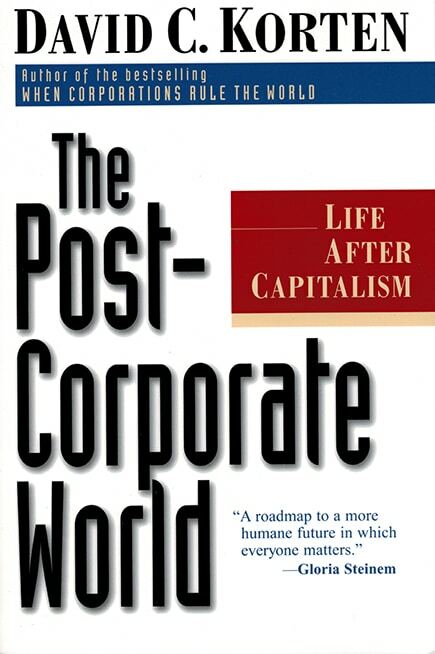 To have a just and sustainable world, society is advised to eliminate that institutional form in favor of human-scale enterprises democratically owned by engaged stakeholders who are liable for their actions. 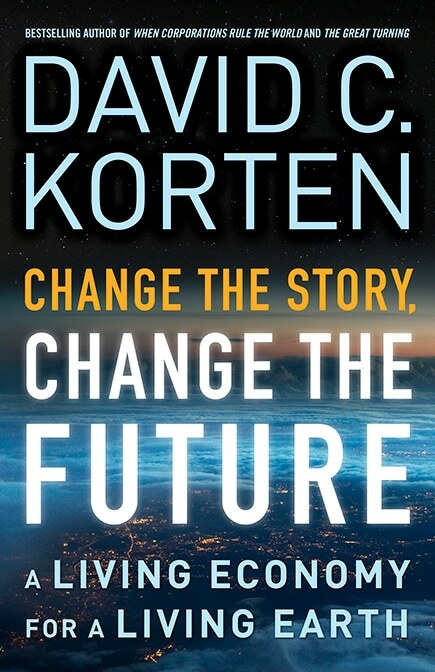 The chapter on international institutions is equally hard hitting, calling for decommissioning the World Bank, the IMF, and the WTO and replacing them with new institutions under the United Nations with mandates exactly the opposite of the institutions they will replace. In the place of a World Bank coaxing Southern countries into ever deeper international debt and dependency, the IFG calls for the creation of a UN International Insolvency Court responsible for helping countries work their way out of international debt. In the place of an IMF that prohibits countries from exercising essential oversight over the flow of goods and money across their borders, the IFG calls for a UN International Finance Agency to help countries put in place mechanisms to maintain balance and stability in their international financial relationships. Instead of a World Trade Organization preventing governments from holding corporations accountable to the public interest, the IFG proposes a UN Organization for Corporate Accountability to work with citizens groups and nation states to break up concentrations of corporate power and hold all corporations with operations in more than one country to a high standard of public accountability. Helping to finalize the report has been my top priority over the past couple of months. Response in Porto Alegre to the preliminary summary of the IFG study by diverse constituencies from both South and North confirmed the importance of this effort. I was particularly struck by the independent responses of three Northern opinion leaders with strong establishment credentials whom I would have expected to be skeptical of ideas so profoundly at odds with the Washington consensus. In rapid succession I was approached in Porto Alegre by Marcello Palazzi, a respected European leader in the area of corporate responsibility; Tom Spencer, former conservative member of the British parliament and former president of GLOBE, an influential international grouping of parliamentarians; and Jim Garrison, president of the State of the World Forum and the Commission on Globalization. Each had a similar message. The IFG report articulates a uniquely comprehensive and credible alternative to corporate globalization that merits serious consideration in civil society, government, and business circles. Each expressed interest in helping to get the study into the hands of sympathetic establishment figures and to draw them into the dialogue. Marcello and Spencer talked of exposing our proposals in forums of concerned business and political leaders. Jim Garrison expressed his interest in distributing the report to the Commission on Globalization commissioners to make it a part of the Commission dialogue. The “living economies” initiative with the U.S. Social Ventures Network (SVN) mentioned in Bulletin #2 has taken off in the space of less than six months with a speed and energy that suggests it is an idea whose time has truly come. SVN is an alliance of entrepreneurs with a passionate commitment to the idea that business can and should be a force for economic justice and environmental sustainability. Most have built and own substantial businesses, which gives SVN serious economic clout. The collaboration with SVN has given birth to a new organization called the Business Alliance for Local Living Economies (BALLE) as an SVN project with a mandate to promote living economies across the United States. The timing is extraordinary as the Enron scandal continues to unfold — revealing such moral decay that even the business press is talking in strong terms about the corruption of the system. 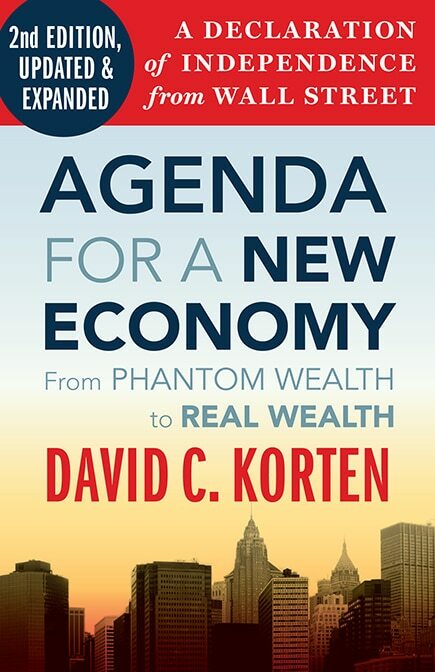 There is a readiness to act to create a new values-based economy comprised of values-based enterprises. The conceptual framework for the living economies initiative is set forth in “Living Economies for a Living Planet,” a PCDF web essay. You may have seen an earlier version. I’ve just completed and posted a major revision and update and urge you to take a look. Feel free to use it in any way you find helpful. 1. Transformational Change: The culture and institutions of living economies are virtually mirror opposites of the culture and institutions of the suicide economy. Far more than a course correction, the changes ahead involve a deep cultural and institutional transformation. 2. Institutional Pathology:Most of the dysfunctions of the suicide economy can be traced to the pathological institutional characteristics of publicly traded corporations — specifically size, absentee ownership, and special limited liability protections. Healthy social function depends on eliminating such pathological institutions in favor of economies comprised of locally-based, human-scale, community oriented, fair-profit/nonprofit living enterprises. 3. A Succession Strategy: Reform strategies seek incremental changes in the culture and institutions of the suicide economy. A succession strategy centers on living into being the web of mutually supportive relationships of a new economy comprised of living enterprises that will ultimately displace and succeed the corporate-dominated suicide economy. Millions of such enterprises already exist — although most struggle to survive at the fringes of the suicide economy. Their future — and the future of the species — depends on growing webs of business relationships among one another to create locally rooted living economies. The strength of living economies will grow as they offer an increasing and ever more visible variety of viable, beneficial options for employment, shopping, and investing aligned with the values of an emerging new majority. 4. 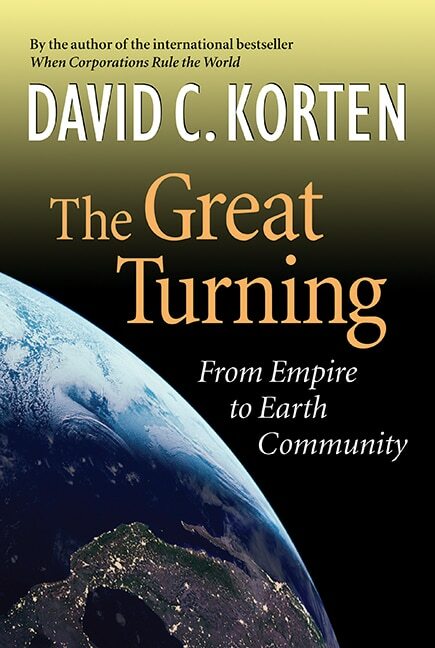 Awakening Consciousness:The potential for transformational change of such magnitude and consequence arises from an evolutionary awakening of a new cultural and planetary consciousness. The awakened consciousness is able to see the profound and troubling truth that humanity is being held back from the realization of new levels of human potential by the persistence of cultural myths that lead to dangerously distorted interpretations of physical and social reality. American Patriotism and Identity in the Reign of George W.
American has long suffered a crisis of identity in the troubling contrast between the American ideal and the American reality. The great and visionary words of the founding fathers of the United States of America are an inspiration not only to Americans, but as well to the world. Yet behind the grand vision of liberty and justice for all there is the dark reality of lands expropriated by force of arms from the native Americans to whom it rightfully belonged, slaves kidnapped in Africa and shipped to America to work that land, and a long history of pursuing an imperialistic foreign policy backed by military force and client dictators to establish and maintain U.S. control of markets and resources far beyond America’s borders. Since September 11, the administration of George W. has attempted to portray any criticism of itself, its policies, and it’s pursuit of endless war as unpatriotic. This accounts in part for the claim of opinion pollsters that 80 percent of adult Americans support the administration. This widely cited figure is highly suspect, not only because of the difficulty of finding consequential numbers of people who truly support the Bush policies, but as well because of the context in which the polling is done. There has been an unusually strong desire among Americans for a sense of solidarity and community since 911. The administration has played this to its own ends by a largely successful effort to portray dissent as outside the consensus of loyal and patriotic Americans who are standing together to protect America from its enemies. At the same time, the administration — with the loyal backing of a fawning corporate media establishment eager for official favors —has sought to lump together protestors and terrorists in the public message and has let it be known that it has the capability to monitor crowds, phone calls, and e-mails in search of terrorist suspects. Now, in the midst of all this, a stranger calls and says: “I’m taking a poll. Do you support President Bush and his policies in the war against terrorism?” The only surprising result is that 20 percent of respondents gave an honest answer. The number of Americans asking questions about current policies is far greater than such polls reveal. Indeed, a great many Americans are not only increasingly alarmed by our government’s actions, they are looking in a serious way at the disjuncture between American ideals and the reality of racism and classism at home and the destructive impact of U.S. economic and military power abroad. We have a lot of serious work to do here in America to turn the American ideal into an American reality. YES! magazine highlights this challenge in its Spring 2002 issue on the question: “What Does It Mean to be an American Now?” It looks at the very different American experiences of native-Americans, African-Americans, and others and explores the meaning of those differences. Like the YES! issue on peace, this issue on patriotism is in high demand by groups all around the country that are using it to engage a dialogue on America as an unfinished project. As you may recall, in addition to publishing YES!, the Positive Futures Network, for which I serve as Board Chair, sponsors a series of invitational “State of the Possible” retreats for leaders of progressive movements from across the United States. We give high priority to assuring diversity among the participants on many dimensions, including racial. Through the experience of these retreats we have been painfully aware of how the racial divisions in America splinter and weaken what otherwise would be a far more powerful progressive movement. PFN’s Spring 2002 retreat will bring together a racially diverse group of 30 movement leaders to discuss “Who Are ‘We the People’ in the 21st Century? Identity, Leadership, and Transformational Change.” Among other things, it will explore questions of grass roots leadership, how the leadership experience is influenced by the diversity of our backgrounds and communities, and what it means for developing a leadership of the whole. It is one small contribution to the larger processes by which global civil society is moving beyond the more familiar “alternatives” role to reposition as an emerging majority forging a new mainstream. So that’s the current view from Bainbridge Island and the PCDF Secretariat. Hope you are all well and that your work for the movement continues to bear abundant fruit.